There was no Thing of the Week last week, but I promise I have a good excuse. I was in the hospital with a stomach bug/virus/thing; I’ll spare you the gross details. I even got a note from my doctor (not really). So to pay homage to our incredibly helpful yet ridiculously overpriced healthcare system, I decided to show that some people have been 3D printing ways to smaller medical bills. Please don’t take my sharing these as recommendations to use them; these are solutions that people came up with to help themselves. If you are injured or sick, seek professional medical attention. This was designed by a parent whose kid was hospitalized and had to have an IV; the hand needed to be braced to keep the hand’s movement from stressing the IV, because kids move a lot. The parent wasn’t satisfied with the bulky and finger-restrictive under-the-hand brace that constantly had to be replaced, so s/he came up with this. This isn’t generally an issue for adults, but it could be useful for anyone that’s mentally ill or not entirely conscious. This dude’s wife broke her toe, so to give it some protection while healing, he thoughtfully printed this splint for her. Aww. 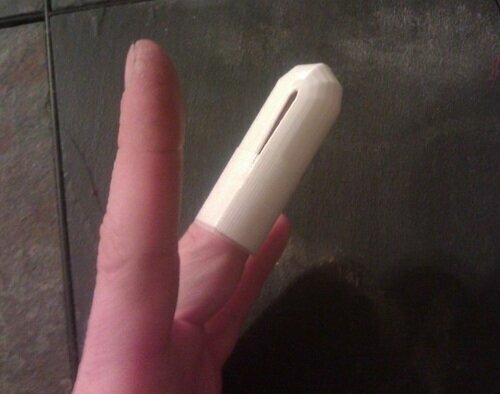 This dude accidentally snipped a bit of his finger off, and instead of going to the doctor for stitches he just printed a finger shield to protect it while it healed. This printed Pinard horn (fetal stethoscope) is part of the WinSenga project, which aims to make antenatal care more accessible to mothers that don’t have access to doctors. With a microphone inside the horn that’s attached to a smartphone, an app is able to analyze the faint heartbeat of a fetus and determine if it’s healthy. Neat! In case you need a new hip on the SUPER cheap. If you’re going to perform major surgery on yourself, you’ll need a few of these. Seriously though, these are probably best kept as little more than fancy bag clips. These forceps could probably help with removing a splinter though. This was also produced by a parent for child; the poor kid broke her leg and wanted to measure the progress of her physical therapy at home, and regular protractors don’t do well for this. If you opted for the DIY hip replacement, you could use this to measure your new range of motion!